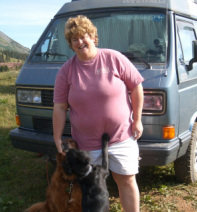 Who participated in Syncro Safari, Colorado '04? Syncroauts, the people inside the Safari. In line with the fun spirit of the event, some of the “Syncro-Kids” at the event, led by Mélodie, created some Syncro Safari awards for participants. Thanks kids! Bob Stevens joined us this year for his first Syncro Safari with his red ‘87 Syncro Westy. Having forgotten that Bob had a TIICO engine in his rig, Syncro Safari came and went and I never even got to see it! At Safari Bob joined us for several trails, but his nice Syncro with the big tube bumpers didn’t make it to any of the trails. I guess that’s how Bob keeps it nice. Bob also brought an exquisitely crafted mountain bike that did see some real trail action during his Safari adventure. Bob won the Syncro Safari “awards” for “Best Looking Exterior” and “Most Expensive Bike”. Dan and Danae Hays traveled all the way from Juneau, Alaska to be at their first Syncro Safari. 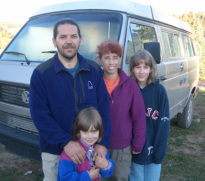 What didn’t travel with them was their Syncro Westy with a 3.4L Chevy V6 engine. Although they tried to work out a plan to drive the van down for Safari, it wasn’t to be. Since Dan had spent a good part of his life living in the Durango area (the nearest sizable town) he just couldn’t stay away while others played with their Syncros in his old “back yard”. Dan and Danae flew to Denver and then arrived at Safari in a rented Toyota Camry. If they had driven from Juneau, their nearly 2,700 mile trip would have been the longest, but flying to Denver disqualified them from the longest drive honor. Staying most nights with friend, Woody at a ranch house near Durango, they did spend a couple evenings with us to share conversation, music, and popcorn around the campfire. 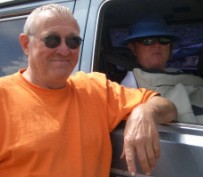 Dan is itching to do another Syncro Safari and have his own Syncro with him next time. He’s hoping for a Canada / Alaska venue for a grand Syncro adventure. Dan and Danae won the Syncro Safari “awards” for “VW Spirit” and “Van with the Most Cylinders”. 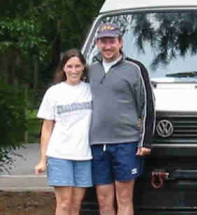 Ian and Tammy Phifer also made this event their first Syncro Safari. Only joining us from Monday night to Wednesday afternoon, they went on to other adventures. Their cat Casper was the first feline to grace a Syncro Safari event, but I don’t think I ever saw the cat outside of their fine silver ‘90 Syncro Westy. Their van has numerous custom features including a pair of especially small, but powerful batteries, big tires, brush guard, and winch mounts front and rear. Their Syncro trip from Charlotte, North Carolina was the longest of the group at nearly 1,900 miles, one way! Ian & Tammy were in and out of Safari so quick they missed the “awards”, but I’d like to nominate them for the “Most Technology in Syncro” Award. Ian’s even replaced his regular dash lights with whiter, brighter, LEDs! Serge, Claire, Mélodie, and Ophélie made this their second Safari. When Ophélie was just 9 weeks old when they attended Syncro Safari, Yellowstone ’99. Getting reacquainted with them again was really great and I enjoyed their company a lot. This year it was Mélodie who lead the effort to provide “awards” for our attendees. Thanks Mélodie! Around the campfire, Serge played the guitar and Claire charmed us with her beautiful voice singing favorites, making up funny Syncro songs and playing “Name-That-Tune” on her flute. Serge brought his road bike and rode it crazy distances at crazy elevations up crazy grades. Oops, have I implied he’s crazy? Serge has outfitted their 91 Syncro Westy with an intercooled 1.6L Turbo-diesel engine, 16” wheels and custom gearing. He’s also included a front diff lock in their hill-climbing monster that was voted most-desirable van at Safari. Their trip from Lethbridge, Alberta was over 1,900Km (nearly 1,200 miles). Their awards? “Van You’d Most Like to Drive Home”, “Biggest Tires”, and “Smallest Engine”. 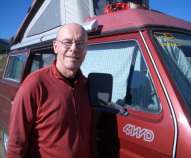 Richard Jones also had his first Syncro Safari experience in Colorado. 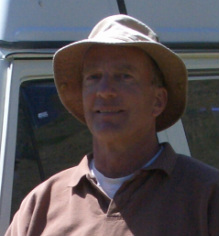 He has a White ’87 Syncro Westy and lives in Boulder, Colorado. 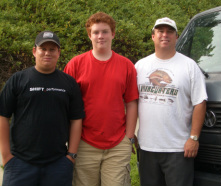 Richard and Bob both brought mountain bikes and enjoyed a ride or two on days when we weren’t 4-wheeling. Richard’s knowledge of the area was helpful and his suggestion that we include the beautiful American Basin on our Cinnamon Pass trip was just perfect. It was a great spot to have a leisurely lunch and wind down from the week of activities. During one of the few moments of significant wind, Richard’s nice Fiama awning was spontaneously “adjusted”, but I’m sure he’s got it back in shape by now. Richard was awarded for “Cleanest Van” and “Most ‘Zen’ Syncronaut”. 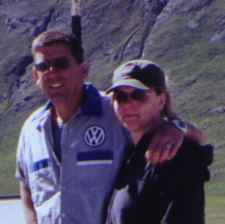 Steve & Jo Ann Wacker attended their 3rd Syncro Safari, having previously participated at Moab ‘98, and Mammoth 2000. From nearby Grand Junction, they had clearly had the shortest drive to Safari this year at about 125 miles. Along with mine, theirs was the only other passenger van at Safari this year, since all the rest were Westies. It was good to have some fellow comrades pitching a tent with me. 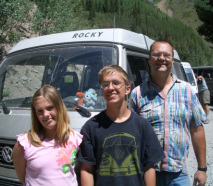 Steve is a tenacious 4-wheeler always ready to tackle the tougher routes and not even seeming to mind as his van slid downhill near a drop-off on the Imogene Pass Trail. As has been the case with all of our previous trips with the Wackers ( Death Valley, Anza Borrego, etc. ), they were good fun and a real joy to spend time with. Steve and Jo Ann can share their award entitled the “I'm-Sure-as-Heck-at-Least-Gonna-Try-to-Make-it-to-the-Top-of-Imogene-Pass-Come-Hell-or-Seized-Water-Pump” Award. Yes, their water pump seized on the ascent side of Imogene Pass. Yes, we had a spare pump and replaced it on the spot! Jim (me) and Matt Davis made this their 4th Syncro Safari, having previously participating at Moab ’98, Yellowstone ’99, Mammoth 2000, only missing the Baja ’01 event. This was Jeremie’s first adventure with this weird bunch of Syncronauts who he described as “obsessed with their Syncros”. We brought our ’87 GL Syncro which was one of only two non-Westies at the event. Our van has custom front and rear “off-road” bumpers, “ Wolfsburg” rear-facing seating, along with custom ice box and sink cabinets. From our home, this trip was a bit over 800 miles one way. I am the proud recipient of the “Techno Geek” and “Best Outfitted Van” awards.